Background It is confirmed that the Ranchu appeared in Kingyo Sodategusa, a book of Japan’s oldest goldfish, but was written in different characters to those used today. This book was written by Yoshiyuki Adachi and was published in 1748. However, the Ranchu of that time is different to the current Ranchu, the Marco, which does not develop a lump on its head (the Marco itself was brought from China to Dejima Island in Nagasaki Prefecture by the Dutch sometime between 1603 and 1868). The Ranchu of today, which develops a lump on its head, was improved over time by Kameyoshi Ishikawa I who lived in Tokyo, who laid the basics of the present-day Ranchu. After that, goldfish lovers and fish farmers tried to further improve the Ranchu. Features The body shape of the Ranchu is round and short with no dorsal fin. It has a thick, short caudal peduncle with tucked-in tail fins on a sharp angle. The lump on its head develops well, and Ranchu that develop a well-balanced lump are considered to be of high value. Principally, their body color is either red or white, or red-and-white. All goldfish without a dorsal fin like the Ranchu are usually viewed from the top. Acquisition difficulties Normal. The Ranchu is typically a luxury goldfish but acquisition is not difficult. However, Ranchu in excellent condition are sold at a higher rate than others. Rearing difficulties Can be normal or difficult. When reared for enjoyment purposes only, there are no particular challenges. However, if you wish your Ranchu to win at evaluation conventions, there are various challenges, such as illnesses and short life expectancy. Details of the above photo The Ranchu in the photo is graceful one year old goldfish reared at the Ishikawa Fish Farm in Tokyo. This fish farm has been operating since Kamekichi Ishikawa I started it. 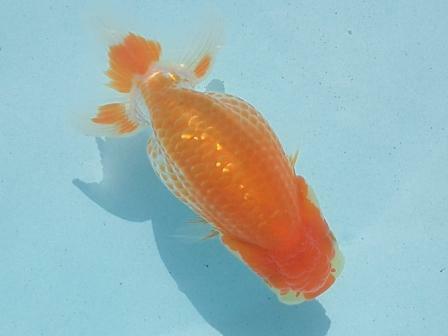 This goldfish has the potential to become an excellent Ranchu.